Ensuring that individuals and families don’t go hungry has been a priority for Action in Community Through Service (ACTS). 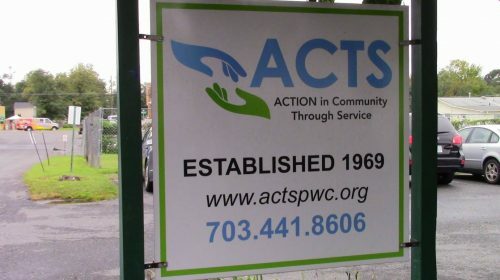 The non-profit, which celebrated its 50th anniversary in February, opened Prince William County’s first food pantry. This year, ACTS in Dumfries is hoping to extend its reach. Through a partnership with 412 Food Rescue, it will launch the Prince William Food Rescue program. By using a phone app, county residents will be able to help transfer available food to the needy. In addition to launching a new program, the Dumfries-based organization is planning to fill units at its Women’s Empowerment Center by July 1. It seeks to help women and families become independent. Community members can provide support to the Women’s Empowerment Center and other programs by rounding up their utility bill or making a financial contribution directly to ACTS.